"Today, we have four machines from as many different vendors. Our focus this time around is more on the products themselves, particularly now that we know how the hardware inside each performs (don't worry, we're running plenty of benchmarks here, too). Each box has its own unique focus. Some aim to squeeze desktop-like performance into a diminutive enclosure, and others minimize physical dimensions while pushing performance a notch higher compared to previous-generation models." Laptops, tablets and smartphones are all the craze. Who wants a big boxy computer that stubs your toes when you are surfing the Internet fantastic? 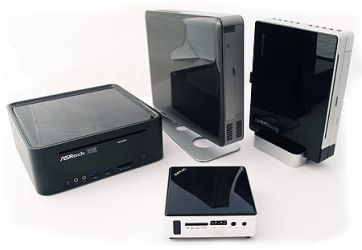 For those of us who still like a desktop kind of setup, these mini-pcs can provide a lot of benefits. Whether they act as an HTPC, office computer, a computer for the kids, or whatever else, space can often be at a premium. Historically, I have seen many of these small machines compromise performance in many ways, however, its impressive to see one of them sport a Core i5. It will not boost your bitcoin mining operation, but for regular use, and possibly even some light gaming, it's great to see these tiny wonders pack a punch!